Thank you for considering volunteering at SPARK Museum in Bellingham, WA. As a volunteer, you can share your time, knowledge and resources in ways that help inspire discovery and creativity in thousands of people each year. Pretty cool, right? 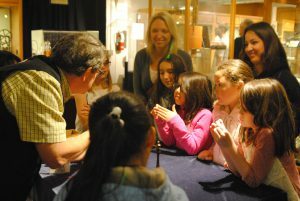 SPARK Museum offers volunteer opportunities for all ages, with or without a science background. The museum provides flexible scheduling (days, evenings, weekends), a friendly staff and an excellent working environment. Please indicate which opportunity you are interested in on the submission form. If you are interested in becoming a SPARK volunteer, please complete the form below, and a staff member will contact you shortly.